For an explanation of what we are aiming to achieve, click here. WOAP writers Jason McKeown (JM), Katie Whyatt (KW) and Tim Penfold (TP) assess the players who have generally lived up to to the high expectations we have for them. 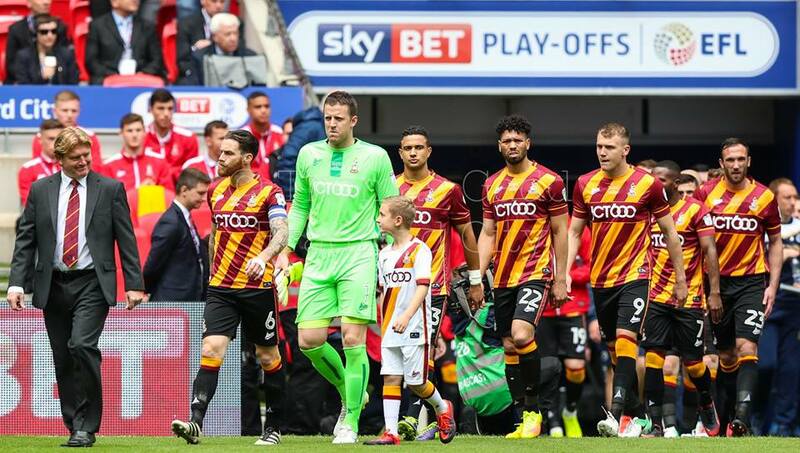 KW: Matthew Kilgallon’s first season at Bradford City was, in many respects, an understated one: he had slipped behind Rory McArdle and Romain Vincelot in the centre back pecking order, and his first whiff of meaningful involvement came as injury cover for James Meredith. For the most part, Kilgallon was a perfectly fine understudy left back (three assists, guys! ), if, naturally, unable to rival Meredith’s snake-hipped dynamism and verve. The upheaval of the summer presented Kilgallon with his first slither of opportunity, and his first chance for a bona fide run in his favoured position. City’s start, however – although encouraging in parts – did yield some rather sizeable teething problems: the 3-3 collapse at the hands of Walsall was, to put it mildly, concerning, and raised questions not only about the mental steel and depth of a squad of an average age of 24, but their game management and defensive wherewithal. As City groped about for a more concrete identity, Kilgallon and Knight-Percival bought the ballast to defence that ranged from untroubled to under siege, sliding and skidding and summersaulting into off-the-lines like McCall’s own version of the Ninja Turtles. The 1-0 home win over Rotherham – after which McCall commended his side so effusively for “having the answers and defending well” – felt like a particularly notable turning point, and Kilgallon and Knight-Percival were bulletproof. In a squad that doesn’t necessarily have a Gary Jones to manically drag less-willing subjects over the line, the maturity and wisdom of the likes of Kilgallon and Knight-Percival enable the culture of trust and self-policing that, despite the squad’s youthful tilt, has thus far paid dividends. Just as striking is their work at the other end – three goals and an assist each, like a pair of fiercely competitive central defensive siblings refusing to be outdone by the other. Combined, until Saturday they had more goals than Dominic Poleon (albeit he has a vastly superior goals-to-minute ratio). It was Knight-Percival winning the flick-on for Kilgallon to open the scoring last week. Name a more iconic duo – we’ll wait. TP: Before the start of the season it was clear that if City were going to have a good season then Nathaniel Knight-Percival was going to have to have a good season, and he has. He’s show impressive resilience in bouncing back from his play off final error, and has also adapted well to a less familiar role on the right side of the central defensive pairing. His partnership with the superb Matt Kilgallon has been a key part of City’s success so far this season. City’s tendency to have a bit less possession and possibly a bit less defensive cover from midfield this season has put the defence under more pressure, but the two centre halves have been equal to the task, and willing to put their bodies on the line to protect City’s goal. Knight-Percival still occasionally struggles with really big physical forwards (see Calvin Andrew) but in all other areas is superb. JM: True goalscorers don’t come along that often, particularly at Valley Parade. Charlie Wyke is proving to be one of them. The most natural finisher the club has had since the heady times of Nahki Wells. A true poacher’s instinct and clinical ability in the box. Wyke is heading towards keeping company with Wells, Peter Thorne, Dean Windass, Lee Mills and Sean McCarthy as a great City goalscorer. Wyke had to play catch up this year, missing all of pre-season and the first few games. After getting going with a memorable hat trick against Bristol Rovers in September, his form has been excellent. 11 goals, and also five assists. A 20-goal season has to be the target, and he’s on course to reach it. City have badly lacked such individual prowess since Wells moved on. 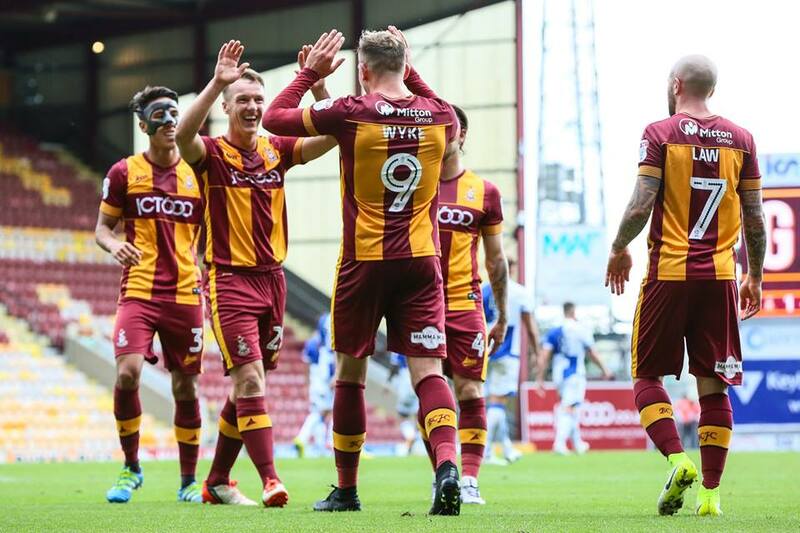 In the interim years, and just on league goals, the Bantams top scorers have been Billy Clarke with 13 (2014/15), James Hanson with 11 (2015/16) and Jordy Hiwula with 9 (2016/17). Not great for a club pushing for promotion. It shows just why Wyke was such an inspired capture last January. Right from the start he hit the ground running, managing the step up expertly. 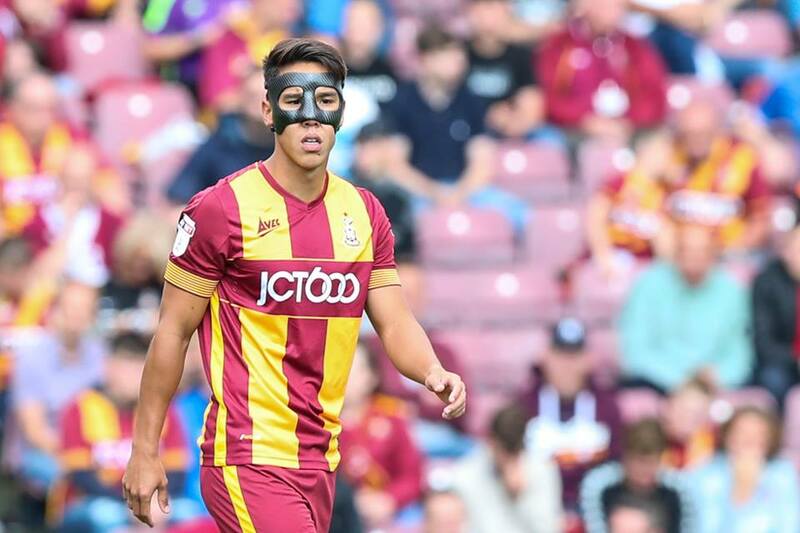 Importantly, you can see the improvement in Wyke as a player over his time at Valley Parade. At Carlisle, he was accused of offering nothing else in the build up play but scoring goals. He’s begun to contribute a lot more at City over time – not only did he net in the recent 4-3 thriller with Rochdale, his all-round play arguably ranked him man of the match. 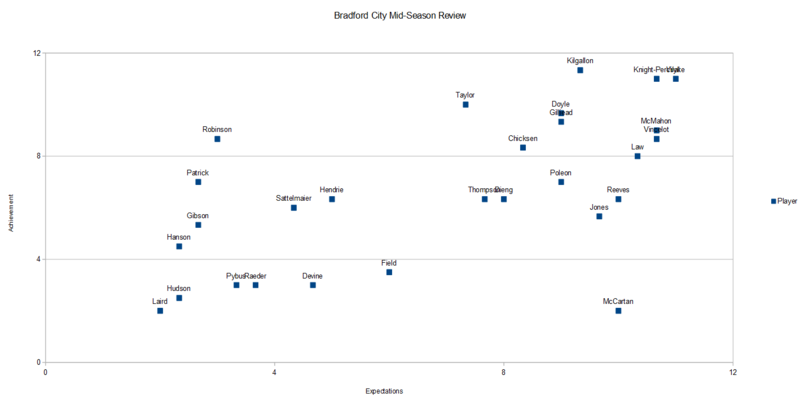 Wyke has stood head and shoulders above every other City forward this season. That’s a problem in that there’s a clear over-reliance on his goals and physical presence, and any injury or suspension will be keenly felt. It’s no wonder that Wyke is one of the first names on the team sheet. Like Wells, he is capable of taking that next step of playing in the Championship one day. If he keeps doing the business at Valley Parade, he just might do it with City. JM: Everyone had a good chuckle when Paul Taylor rocked up in the summer. His appearance and his mannerisms seemed more scallywag than superstar. His advancing years and catalogue of career problems carried more than a whiff of desperation from Bradford City in signing him. Young and hungry he was not. But if there is a Moneyball-esqe approach behind the transfer committee, Taylor is the David Justice of Billy Beane’s initial experiment. Taylor was shunned by Peterborough, where he was in and out of the side, and overlooked by the rest of the market. Like Beane with Justice, City saw the value that Taylor could still offer. Rather than a panic signing, it is proving inspired. Taylor has settled down and let his football do the talking – he won’t yet speak to the local media – to win over the doubters. Once fit, he has become the team’s creative spark. Someone to build the attack around. Taylor has revelled playing deep in a number 10 role, setting up attacks and willingly shooting from distance – twice with especially memorable results. As the Rochdale game showed, he can also play out wide effectively. In McCall, Taylor has the sort of man-manager that has got the best out of troubled souls – see Marshall, Mark. Whatever Taylor has got wrong in the past, the arm-around-the-shoulder approach is working and working well. Taylor has become an increasingly influential signing, and he seems to have found the ideal home to demonstrate his considerable talents. JM: In the opening minutes of the opening game, against Blackpool, Colin Doyle came to catch a routine cross but missed the ball, almost resulting in a goal conceded in embarrassing fashion. That minor lapse of concentration paved the way for a strange and unfounded anti-Doyle campaign from a section of City supporters, convinced the Republic of Ireland stopper wasn’t up to the job. Doyle is far from the greatest stopper in League One, but his performances this season have ultimately silenced his critics and demonstrated his value as City’s first-choice keeper. Mistakes are hard to find – he was harshly blamed for Oxford’s opener in September, and Scunthorpe’s equaliser in November was definitely a bad Doyle moment. But they are more than overshadowed by his achievements. City’s strong away record is certainly in no small part down to Doyle’s heroics, as he has produced a string of key saves at vital moments. His distribution is also of a high standard, and he exudes calmness that spreads across the back four. Doyle isn’t a headline-grabber type of keeper, but he’s won points for his team through his strong form. It says everything about him just how many stops McCall has pulled out to make sure he could still play even when on international duty. Now out injured for three months, Rouven Sattelmaier’s decent, albeit far-from-perfect, form has limited how much Doyle has been missed; but he’ll likely reclaim the starting jersey when fit. He’s enjoying a good campaign, even if some will only agree begrudgingly. TP: Alex Gilliead had a promising spell on loan here last season, albeit one disrupted by injuries just as he was establishing himself in the team, and City fans were universally pleased to see him return to the club in the summer. His season started slowly – with Charlie Wyke injured, there was no room for an out-and-out winger with nobody to cross to – but with Wyke back, Gilliead has made himself the obvious choice on the right flank. There have been the usual grumbles that you hear about most wingers – a tendency to drift in and out of games, and a lack of tangible end product, but his performances have mostly been good. His ability to bring the ball up the pitch at pace means that he can take the pressure of the defence, much like Mark Marshall and Kyel Reid used to, and his ability to go past defenders means that he wins a lot of free kicks in good attacking areas. His end product is also improving – he’s been directly involved in goals in the last five games – and he was a bit unfortunate beforehand to not have any assists. 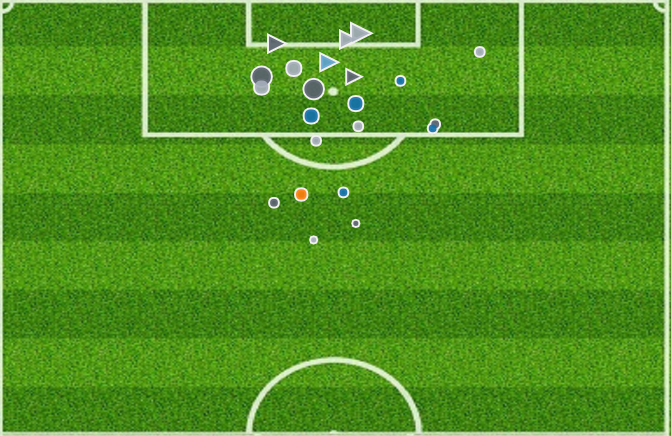 This shot map shows the chances he’s created in the league (not including the Rochdale game, or the Shrewsbury own goal as it wasn’t a shot) and shows that he’s been a bit unlucky that his crosses haven’t created more goals. Keeping him in January in the face of Championship interest will be important. KW: Trying to pinpoint, retrospectively, what everyone expected of Adam Chicksen isn’t easy. Chicksen is one of the few players for whom ‘our expectations’, whatever they were, is a slightly uncomfortable way of measuring success. Despite the summer of upheaval, there weren’t many players – the Reeves-Cullen axis aside, maybe – primed to be evaluated as exclusively and as obviously against the player that came before as Chicksen was. Gilliead vs Marshall, maybe, but the knowledge that both are decidedly different wingers discouraged any explicit comparisons. Paul Taylor wasn’t really a direct replacement for anyone. McCall suggested at the outset that Shay McCartan might have the makings of a Billy Clarke, but his best role is still unclear. Yet it was impossible to frame any debate around Chicksen without mentioning James Meredith. At the time, that seemed a perfectly valid school of thought: Meredith had spent the last three seasons being one of the best full backs in League One, that perfect blend of physicality and intricacy – all pace and reckless abandon to pelt down the flank but moreover with the tenacity and vision to spin and wheel past his full back with pure menace. Under McCall, he had blossomed in his new wing-back role: more than that, he became a natural ally for Billy Clarke and Nicky Law, an easy wall-pass to keep City ticking over, shimmying and scuttling as City’s offensive Rubik’s Cube shuffled and reshuffled through the gears until they found an opening. Expectations were always more a case of what Meredith was rather than what Chicksen is or could have been. And, to most minds, Chicksen – three years younger than Meredith and despite several successful League One spells – could never be what Meredith was, in the same way Kilgallon, though a passable left back who clocked up three assists as injury cover last season, was just not quite Meredith. The stats showed Meredith was irreplaceable. 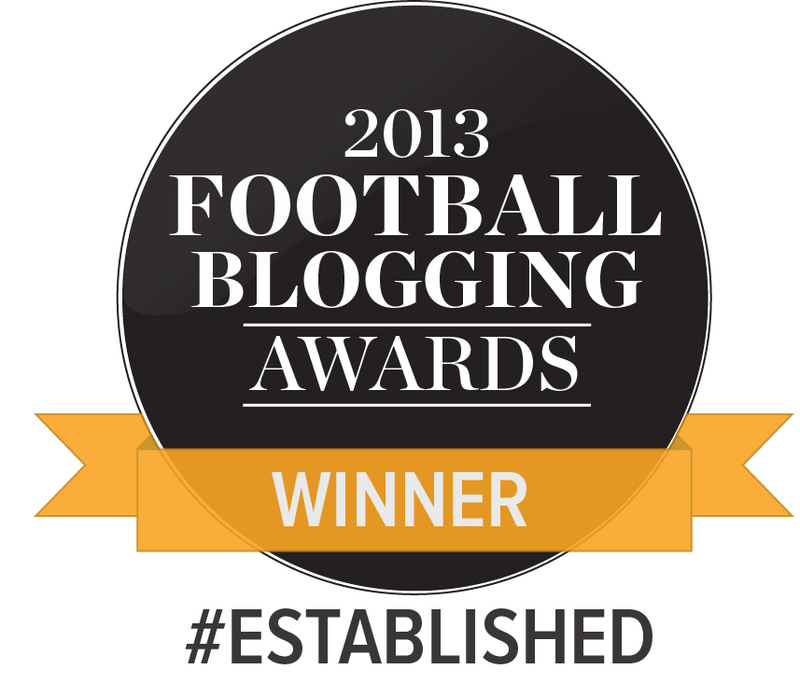 Anyone who tried – Greg Leigh, Alan Sheehan, Benjamin Mendy – succeeded briefly, before being hunted down and, um, exiled. Again, expectations were bound to what Meredith was rather than what anyone else was likely to be. Chicksen’s season was poised to be defined on how well he filled the void. Pre-season hadn’t boded so well. City had been outgunned against Sunderland and Newcastle and Chicksen had been the main victim of City’s relentless (and perhaps naïve) forward-thrust, lacking Meredith’s natural athleticism and positional intelligence. There were mitigating circumstances, of course – but, still: it was concerning. With that in mind, Chicksen’s season was clearly going better than anyone had dared to hope. He was doing perfectly fine – the end. Maybe he couldn’t rival the ornateness with which Meredith dovetailed and interchanged with the likes of Clarke and Law, but, in a squad built to be a tad more direct, perhaps Chicksen was working with a different remit. That aside, Chicksen had the positional range to rival Meredith, the same daring tempered by the same wisdom. In some senses, Chicksen might even be an upgrade on Meredith, who, for all his qualities, rarely crossed from deep; yet this is Chicksen’s speciality, and his crowning moment came in September when, swiftly glancing up, he planted a perfectly arcing cross onto the head of Charlie Wyke to break the deadlock against Doncaster Rovers. It should have been a sign of more to come and, in a team – intentionally or otherwise – that thrives off crosses, Chicksen could have grown into one of the squad’s most potent offensive weapons. And then he got injured. It would be difficult – and probably tenuous, at best – to attribute City’s home struggles – namely, their inability to break teams down after going behind – solely to Chicksen’s absence, but the debate is a valid one: just how much are this team, for whom McMahon’s clinical delivery has proven their most convenient route to goal, missing an Adam Chicksen who would have offered exactly the same thing? The debate is the same but the names have changed: with Chicksen, might things have been different? But if there is a Moneyball-esqe approach behind the transfer committee, Taylor is the David Justice of Billy Beane’s initial experiment. Moneyball is a very famous player recruitment philosophy introduced in baseball that targets players overlooked by the market so cheaper to buy. It has been adopted in football with less success, most notably by Liverpool FC (why they signed Stuart Downing for example) but the ethos behind it is used by clubs. Suggest you read up and watch the film about it. Very interesting stuff.